In a fast and modern world, our itineraries and interactions are almost in a way instant and virtual. Communication with a designated individual might encounter misunderstandings along the way. It is worth reflecting on the physical presence brought upon greeting cards. The beauty of the latter is its intimate conveying of good wishes which reveal personality as well as having no limit to expressing emotions which are an awesome mix. Who would have thought a greeting card could do so much. 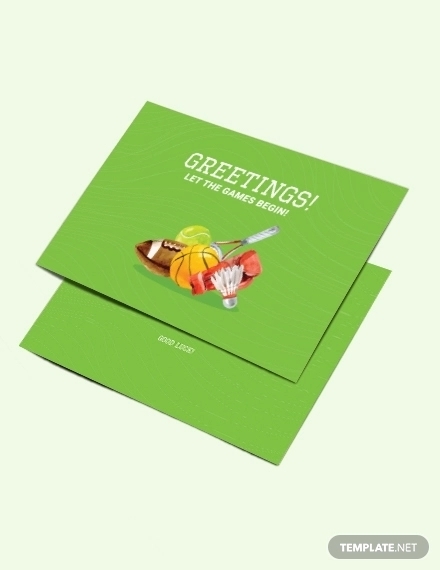 Lucky for you, we have gathered a collection of greeting cards that showcase different occasions as well as design styles for an extensive selection. 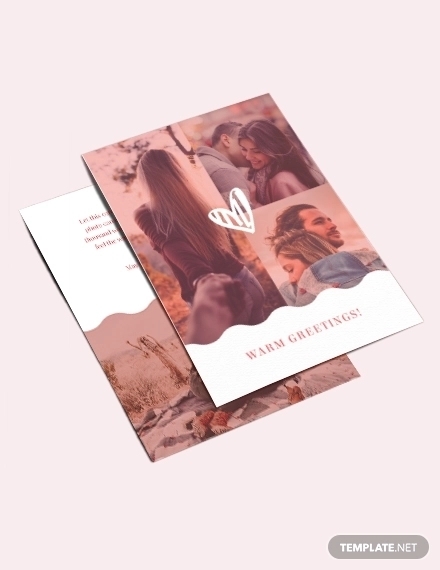 These greeting card designs are perfect to utilize for personal uses, design references, presentations and for future references.You may view our list of free PSD greeting card mockups and we promise you that all are provided in a downloadable format. 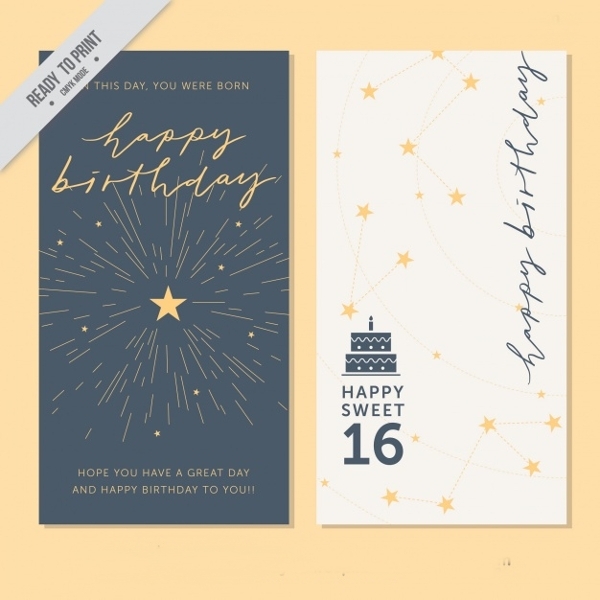 With our list down below, we have selected greeting card designs of variety and taking a different approach to probable recipients of any of these greeting card designs. The list of greeting card designs ranges from birthdays, weddings, holidays, annual events and special events. Without any further ado, scroll down below to skim through our collection of greeting card designs. The list covers birthday greeting cards for all ages as well the complex personalities of probably designated recipients which executed in various design styles. 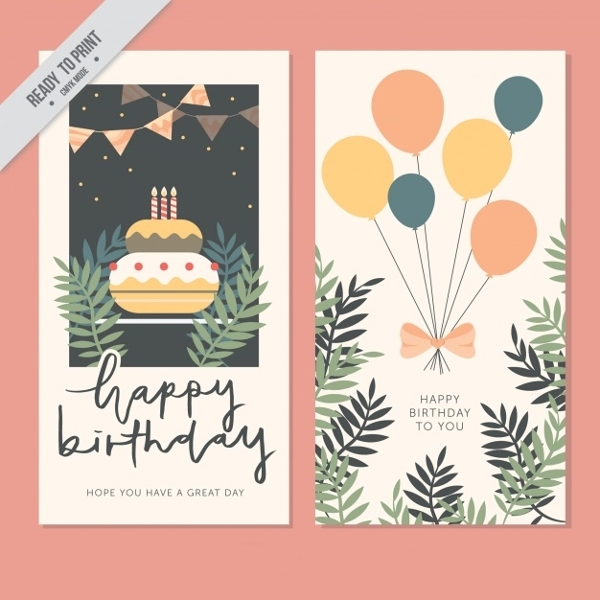 28 Greeting Card Design & IdeasIf you are going for a subtle and mature birthday greeting card, the Subdued and Vintage Style Birthday Greeting Card is up for grabs. It delivers a delicate use of typography and simple flat graphics. 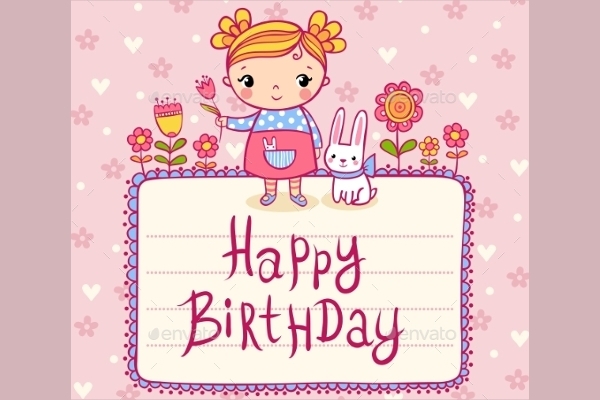 This specific birthday greeting card is contradictory to the standard of birthday designs which makes it mighty fine and even possesses a personal familiarity with the designated recipient. Sans of any explosive and festive design elements, the design on this birthday greeting card brings about youthfulness. Celebrate your friend, co-worker or partner and so on with this festive yet moderately designed birthday greeting card. With the use of complementary colors brings cohesiveness to the theme. As well the as the decorative type creates a playful exterior. Birthdays are filled with excitement and reveling in the celebration which you may associate such with this specific birthday greeting card. 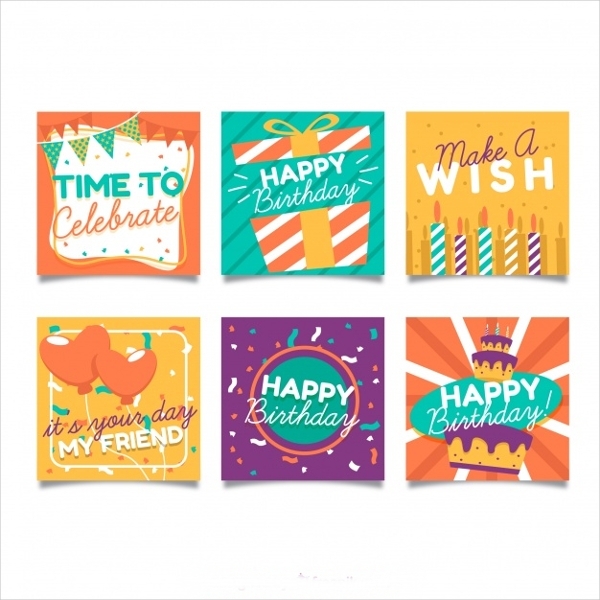 It uses complementary colors and font pairings, as well as the design elements such as the backgrounds and party essentials, expresses playfulness.celebration which you may associate such with this specific birthday greeting card. In our list down below, we gathered a couple of wedding greeting cards that are designated for the individuals in the LGBTQ community. There are less impressive designs for such and are little to none greeting cards designs available. Let this list help you in your hunt of wedding greeting cards and bring about acceptance and celebration to the LGBTQ individuals. Simple and direct. Sans of any intricate design elements, the conic LGBTQ symbol, rainbow, is given emphasis. Despite the low contrast use of colors with its rainbow, the message “love wins” speaks for itself. This bold and powerful wedding greeting card defines the constructs of gender as well as the traditional perspective in terms of marriage. Show your pride and pass on good wishes to the designated recipients with this endearing wedding greeting card. With the use of A Toast to the Brides wedding greeting cards is an endearing way to convey your good wishes to the married couple. We strongly suggest not to pay any attention to the unpatched area of the toast. Holidays, specifically during Christmas, are the events that individuals get to give and receive a handful of greeting cards. Whether it is for their family members, friends and so on. It is no doubt that such amount is observed, we can’t help it but feel grateful and full of love. Holidays are a get together with family and friends and has been a tradition in most cultures. With our list of holiday greeting cards below, best represents the variety and personal interpretations of Christmas across all countries. 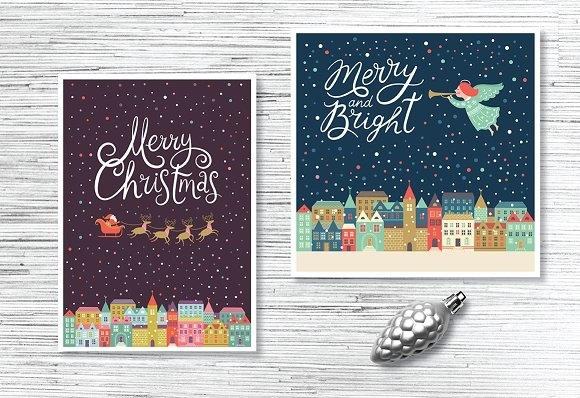 If you are going for an intricate and illustrative greeting card, then the Lighthearted Set of Christmas Greeting Cards is a great option to consider. The set comes along with the example displayed above as well as with other design variations. 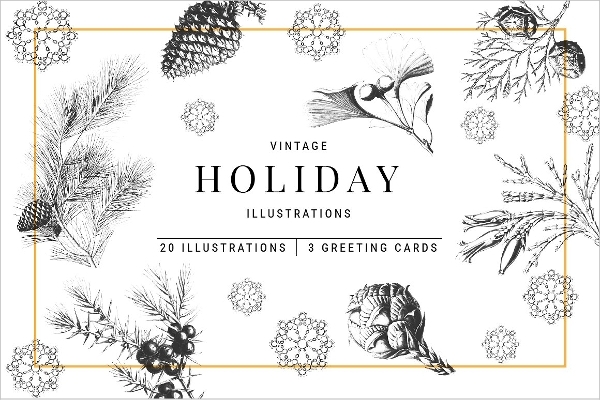 For a more traditional approach for your greeting card design, the Hand drawn, Vintage Christmas Illustrations and Greeting Cards best represents such artistic direction. With a handful of inclusions, your holiday greeting card will be ready in no time. 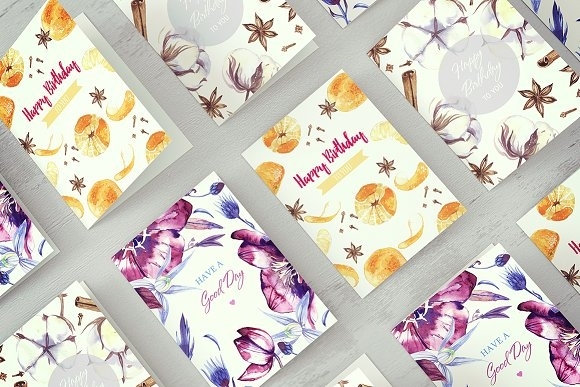 Going for a different direction with your greeting card design? 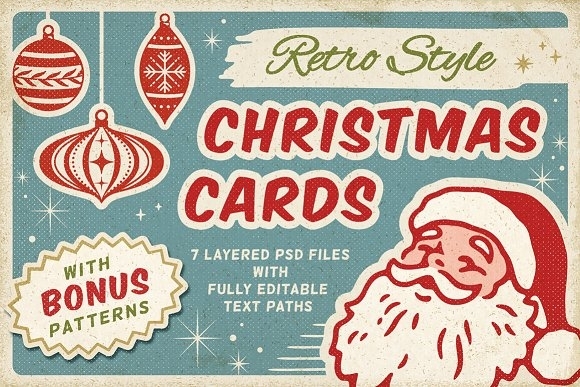 Lucky you, the Retro Christmas Cards with Bonus Patterns offers a retro design style with its line up of greeting cards. 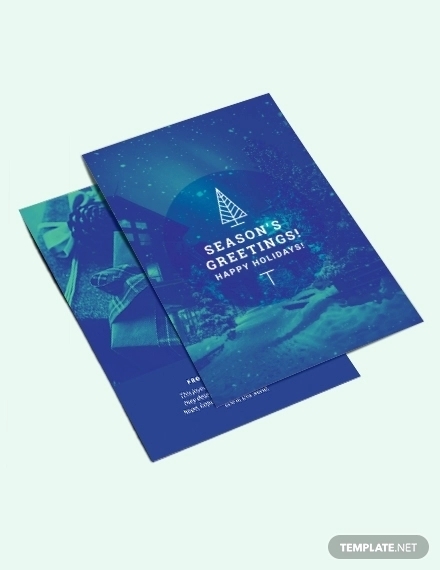 It comes with layered PSD files and editable paths for a quick customization for your holiday greeting card. What better way to be personal and intimate with your content is through greeting cards. The list down below includes special events such as Mothers and Fathers day and Valentine’s Day. If you are looking for design elements that could craft your entire Valentines greeting card, then look no further. 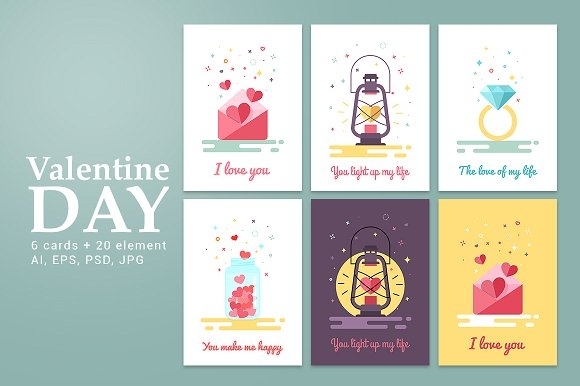 The Set of Valentine’s Day Greeting Card Templates comes with a set of various papers, greeting templates and so on. If you want to directly announce your love and affection to the designated recipient, these specific Valentines day greeting cards are great options to consider. It is crafted in a flat design style and the set comes with six design variations for a more extensive selection. Greeting cards are one of the ways to express our affection as well as respect for our matriarchs. In some cases, we find it hard to convey our messages verbally. A physical medium such as greeting cards allows us to be personal and intimate with our content. With the help of greeting cards, you may find comfort in writing down what you wish to communicate. 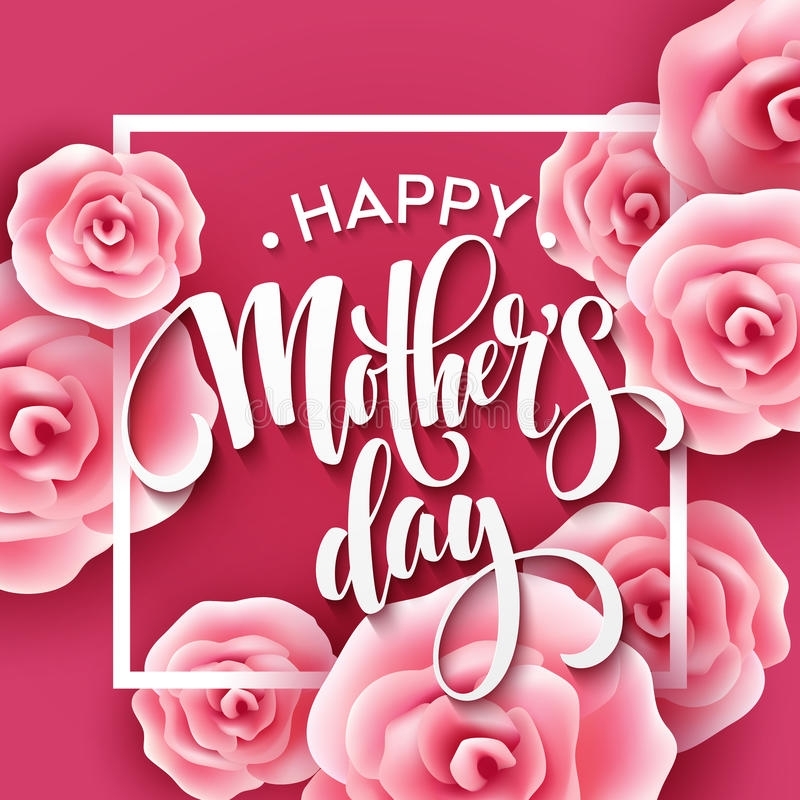 Scroll down below, to bask in on some of the impressive and heartwarming examples of greeting cards for Mother’s Day. It is safe to say that our matriarchs are as beautiful and as precious as the rose that blooms. Roses are one type of flora that is associated with passion and love. With this mother’s day greeting card that illustrates a rose garden, best represents our appreciation and undying respect for our matriarchs. Another flora design inspired mother’s day greeting card. The use of calligraphy style typographical element brings about gentleness and fluidity to its appearance. 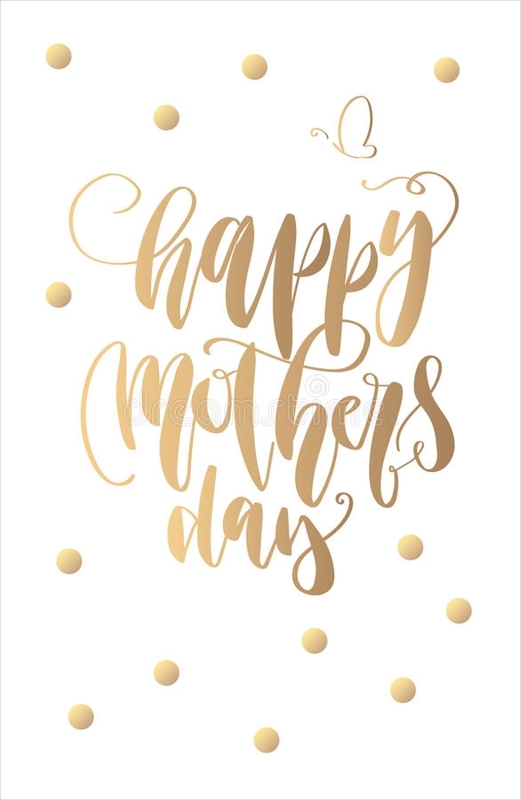 The Mother’s Day Greeting Card Lettering & Vector Illustration is available in various sizes to match your preference and for printing choices. The use of typography in design has seen its resurgence in the recent years. It is an awesome mix of the traditional technique combined with digital manipulation and process. The gradient application on the typographical and design elements brings dimension allowing its appearance to have depth. 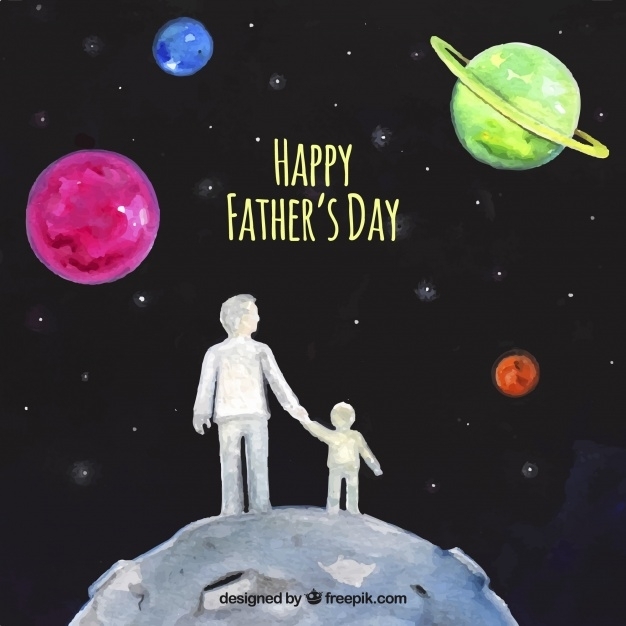 Father’s day is celebrated as an appreciation to the fathers and father figures that made a mark in our lives. Handing out father’s day greeting card is well-appreciated. For a more extensive selection, you may skim through our heap of to the fathers and father figures that made a mark in our lives. Handing out father’s day greeting card is well-appreciated. For a more extensive selection, you may skim through our heap of to the fathers and father figures that made a mark in our lives. Handing out father’s day greeting card is well-appreciated. 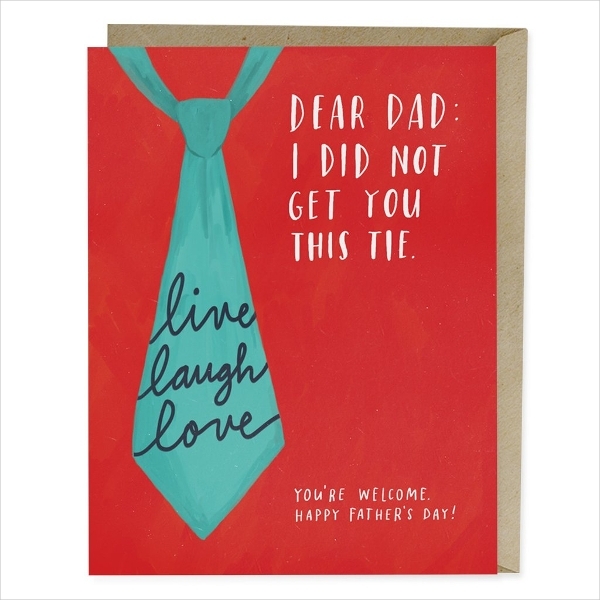 For a more extensive selection, you may skim through our heap of printable father’s day greeting cards. Patriarchs are subjects to strength which is best represented in this digital art. The latter is crafted well-incorporating shadows to avoid the image from falling flat. One of the commonly used design elements in father’s day collaterals are ties, business suit, and corporate elements. But this specific greeting card added such but swayed a bit with the touch of typography and emphasis on its message. This moving and special illustration of a father and son best represent their personal bond. It could be subjective to what this artwork demonstrates but that is the beauty of this design after all. 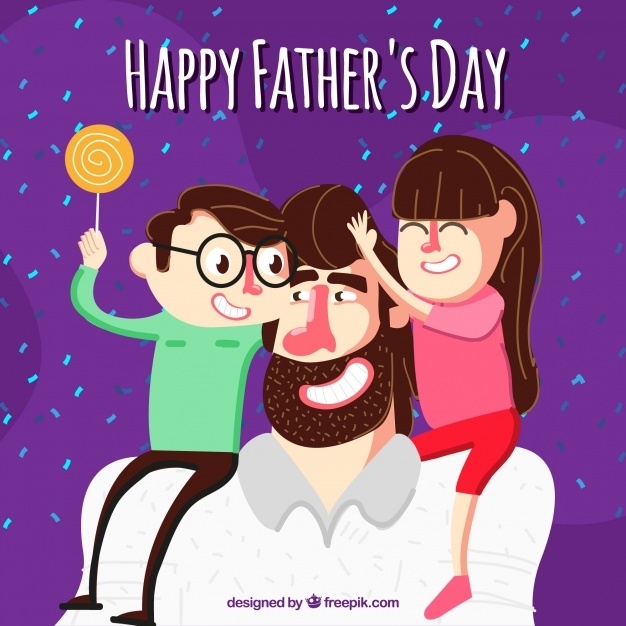 For more Father’s day designs and gift ideas, this collection of illustrated father’s day cards are as special and brings about a certain of humor. The list below consists of greeting cards fitting for special occasions such as graduation day, pride month, coming out and so on. You may also use these examples for other occasions that were previously mentioned such as birthdays and so on. Bask in on the beauty and the humor presented with these heap of greeting cards for special occasions. 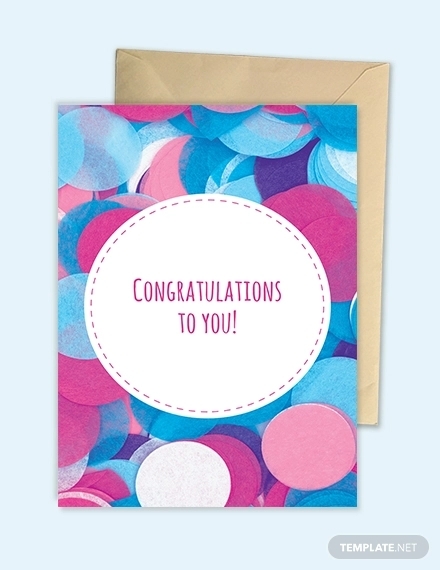 Celebrate and give praise to the achievement passed by the graduate through the use of greeting cards. One unique feature of greeting cards is their physical permanence which you may read and re-read sometime. As well as shared and passed on to curious readers. It serves as a reminder especially for graduates that love and support are behind them. 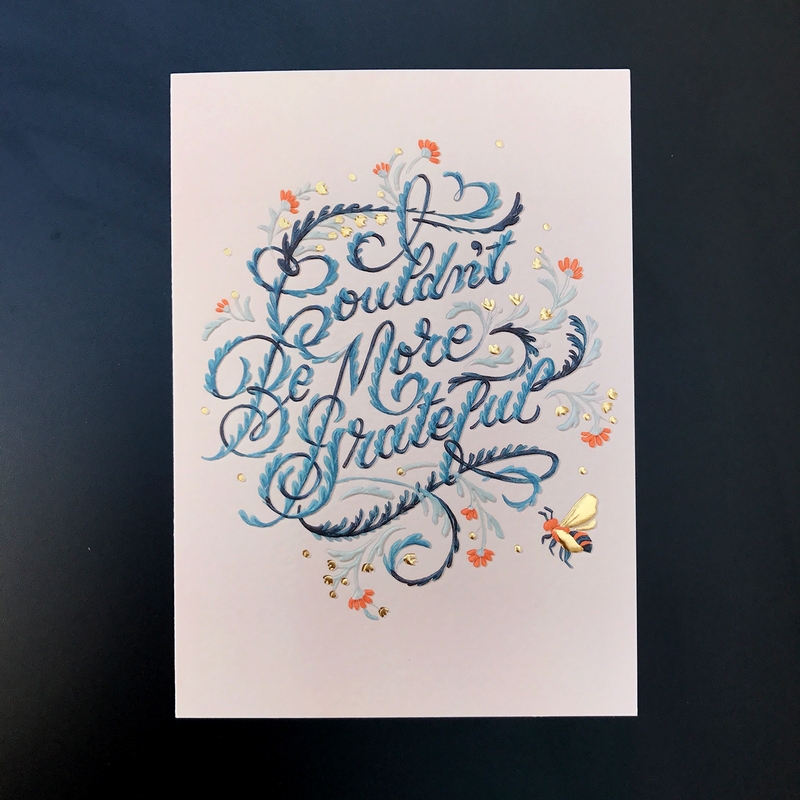 Now, our list of graduation greeting cards demonstrates such positivity and celebration every graduate needs, in the long run, .reminder especially for graduates that love and support are behind them. Now, our list of graduation greeting cards demonstrates such positivity and celebration every graduate needs in the long run. Having to close that chapter in one’s life might bring upon the uncertainty of what comes ahead. But that should not entirely be the case. 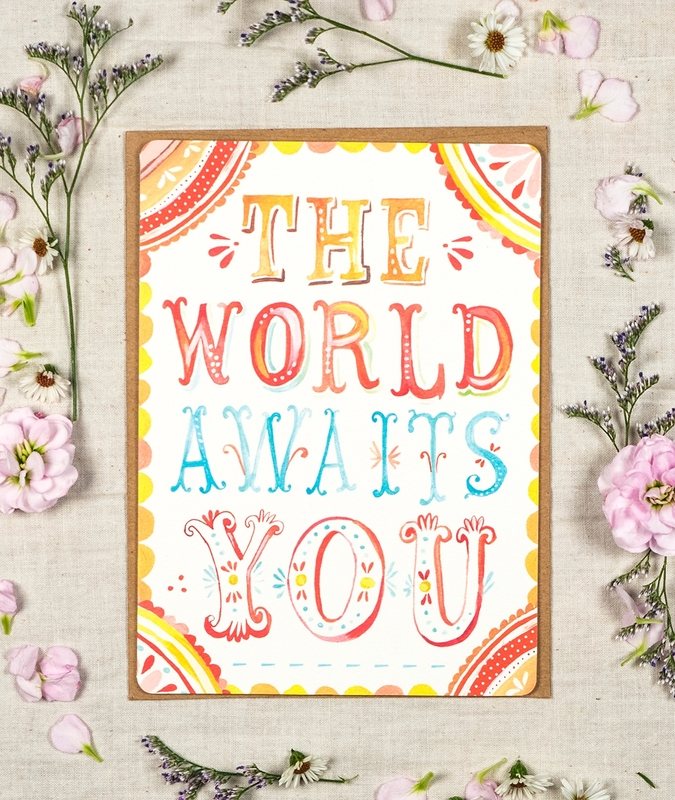 Show your support with The World Awaits You Graduation Greeting Card that possesses a positive motivating force. A physical reminder to let life come to you and to live life to discover. 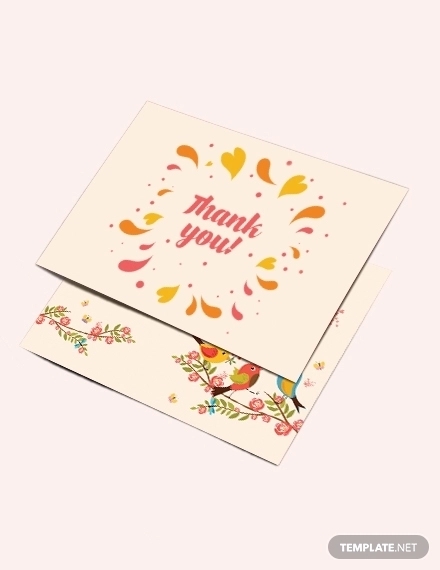 With a delicate and rather a traditional take on graduation greeting card, the Watercolor & Illustrative Graduate Greeting and Congratulations Greeting Card is a present well appreciated. Its design brings upon a modern appearance as well as a lighthearted personality. It is a long and winding road down there but as cliche, as it may sound, it’s about the journey and not the destination. 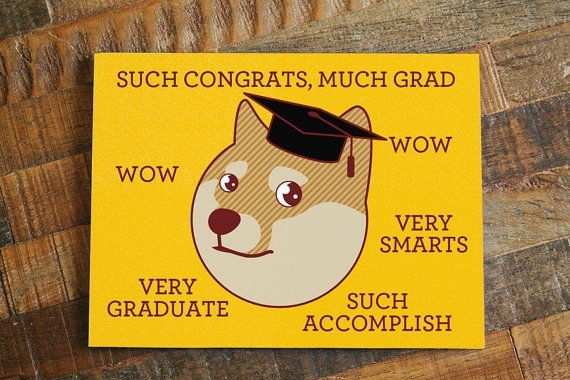 Pass on such wisdom and positivity with the help of this specific graduation greeting card. It is available in three color variations which you may match with the designated recipients color preference. Oh, kids these days. The Congratulations Graduate Greeting Card / Dab demonstrates a popular pose these days, dabbing or dab. It does possess an esoteric quality to it but it is funny and victorious in its message. Greeting Cards for Special Occasions. This Congratulations perfect for the Rupaul’s Drag Race super fan out there. 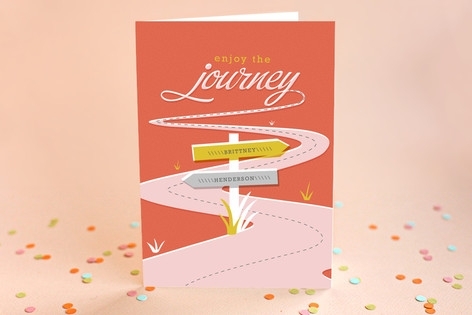 Whether the agenda is for graduation, getting hitched or even coming out, this greeting card expresses great wishes to the designated recipient. One way to pop a greeting to the designated recipient is by sending out this Alaska Thunderf*ck 5000’s Hiiiieeee greeting. The latter is a RuPaul’s Drag Race thing and in the drag scene in general. You may utilize this greeting card to events and occasions such as pride month, congratulations greeting, birthdays and so on. 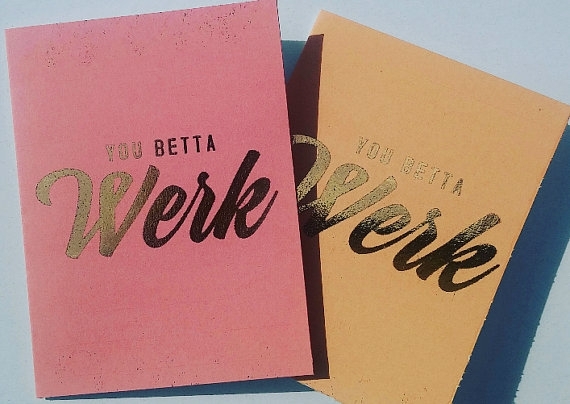 Whether you are on the runway or your current job; you betta work. What you see are not grammatical errors but an application of drag lingo. The beauty of this greeting card is its foil application on the physical medium and direct message. This set is available in two color options. The greeting card designs are one way to express good wishes to the designated recipient. But the content of the physical medium completes it. 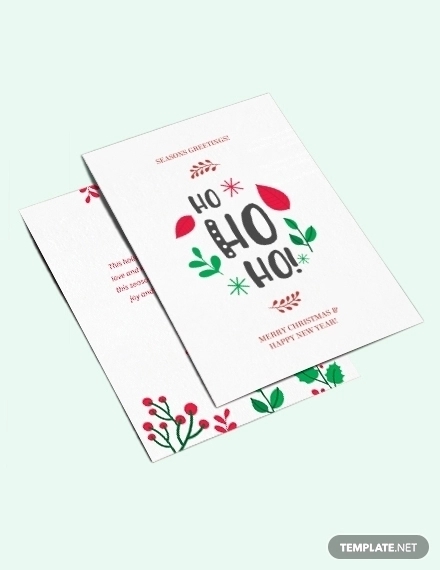 Just before you send your greeting card to the designated recipient, keep in mind to execute a neat appearance on the exterior as well as the envelope. Not only does it enclose the greeting card but it serves as a medium in not giving away too early. You may view our list on envelope mock ups which you may utilize for your greeting card. Make sure to save and print your greeting card in a CMYK color mode to retain its designated color once printed. Run through the technical elements such as grammatical errors, spelling, and any lapses in the sentences. This is to ensure that the recipient will have a measured response to your greeting card…..its designated color once printed. Run through the technical elements such as grammatical errors, spelling, and any lapses in the sentences. This is to ensure that the recipient will have a measured response to your greeting card. Before we call it a day, we have more offerings that were glad to share with you. Fathers, beyond their patriarchal roles, are also known for their sense of humor and sometimes fashion. Send some love and laughs with our heap of were glad to share with you. Fathers, beyond their patriarchal roles, are also known for their sense of humor and sometimes fashion. Send some love and laughs with our heap of were glad to share with you. Fathers, beyond their patriarchal roles, are also known for their sense of humor and sometimes fashion. Send some love and laughs with our heap of dad bod father’s day greeting cards. Yes, dad bod. Now off you go.